It may be a rare day when one says, “We should go out for Salvadorian food,” but that could change if you’re stopped at the light at 500 East while driving west on 2700 South. Glance out the window and you’ll see a distracting sight: a building on the corner with a banner for Fernando’s Cafe Guanaco proclaiming “Salvadorian Food,” along with some hunger-inducing pictures. 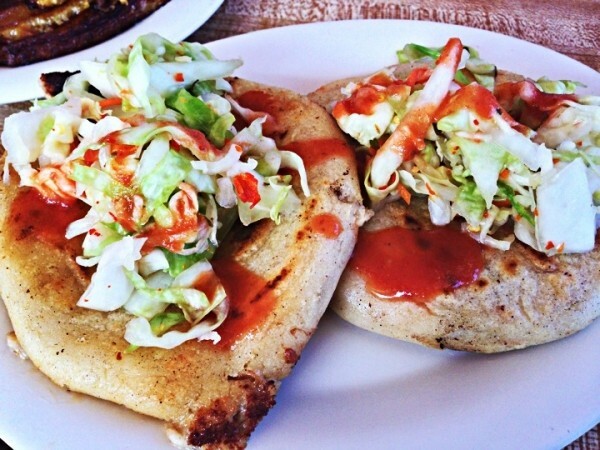 Cafe Guanaco’s specialty is pupusas—a traditional Salvadorian dish made of a thick, handmade corn tortilla filled with a mixture of beans, meat and cheese—and you will find them here in abundance. At $2.15 each, you may think that you will need a few pupusas—until you take your first bite. The dense tortilla is loaded with your chosen ingredients (pork, chicken, shrimp, steak and zucchini are available as the main filling); top it with a spicy slaw and some hot sauce, and you’ll be full. One is a meal; two is a feast. Appetizers, entrees and soups are also available. For desert, the fried plantains are soft, sweet, caramelized bites of deliciousness. Fernando’s Cafe Guanaco may be the textbook example of hole-in-the-wall. There are four tables inside and three outside, with mismatched chairs. The décor doesn’t matter, as all the attention has been given to making amazing food and a great experience for the customer.